Do you suffer from headaches, gastrointestinal distress, skin issues, pain/arthritis discomfort, asthma, allergies/sinus problems, hormonal imbalances (PMS, menopause, ED, etc. ), poor quality sleep, or any other ailment? Are you looking for a more natural way of managing ADD/ADHD? Do you wish for balance and to improve your quality of life? Have you visited multiple doctors, had multiple tests, and still are not satisfied with the answers you received? Naturopathy could be your solution! When medical doctors diagnose a disease, they are actually only identifying the symptoms of a greater underlying problem. Disease is nothing more than a manifestation of the body trying to correct imbalances. These imbalances can be caused by faulty nutritional patterns, improper rest, poor stress management and other lifestyle considerations which over time result in a weakening of the body. By the time disease appears, it is very late in the game. Naturopathic medicine is based on the belief that the body can heal itself naturally. It encourages a healthy, balanced lifestyle. Naturopathy concentrates on identifying destructive aspects in lifestyles that lead to imbalances. Before symptoms manifest and long before a diagnosis can be rendered, these destructive aspects of lifestyle can be identified and corrected. Once corrected, the body automatically balances itself. Diagnosing disease and illness is totally unnecessary to correcting the underlying problems that result in disease and illness. A true healer does not waste his time concentrating on naming diseases, but rather on identifying those underlying factors that if not addressed result in the manifestation of disease and illness. These factors can be identified and corrected long before it is even possible to make any diagnosis. Even after a diagnosis is made, the same concepts of healing used by traditional naturopaths are equally effective because once balance is restored the body automatically heals itself. That is what it was designed to do. If you are ready to begin the process of identifying the factors that are causing distress and imbalance, you have come to the right place. Functional Medicine Naturopathic Center offers you a proactive approach to improving your health. If you have tried everything else, this could be the answer. Practicing Traditional Naturopathy under provisions of Minnesota State Statute 146A. 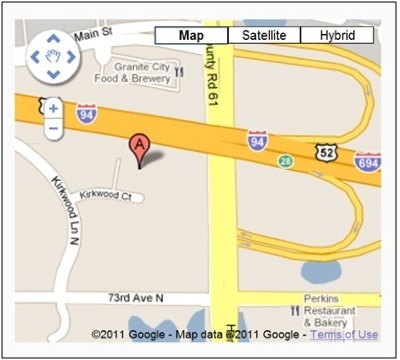 Address: 7364 Kirkwood Court N.
From the North / West - take 94 East to 694 East. Take the Hemlock Lane exit and take a left onto Hemlock Lane. Go to 73rd Ave North and take a right. Then take the next right onto Kirkwood Lane North. Take another right onto Kirkwood Court. Office is the third building on the left on the back side - first door. back side - first door.